THORNTON, Colo. – The three victims of Wednesday’s shooting at a Thornton Walmart were identified Thursday afternoon by the coroner’s office for Adams and Broomfield counties. They are 52-year-old Pamela Marques of Denver, 66-year-old Carlos Moreno of Thornton, and 26-year-old Victor Vasquez of Denver. Carlos Moreno was a structural trades technician at the Auraria Higher Education Center in Denver, the campus confirmed to Denver7. 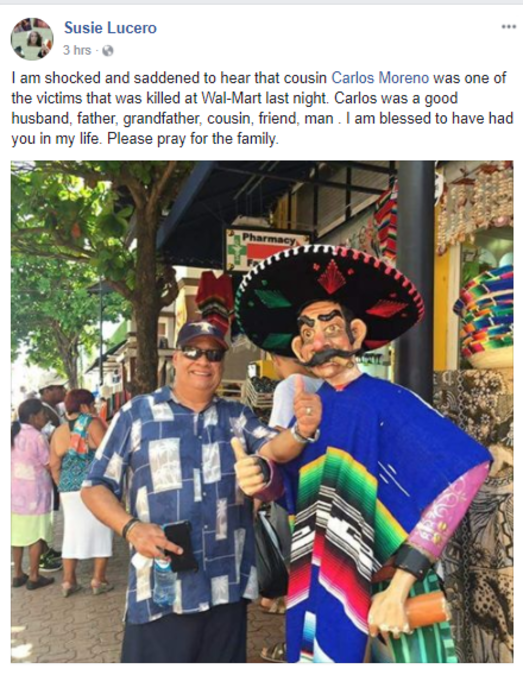 Family members of Moreno’s also wrote on Facebook that he had been killed. Victor Vasquez was a father of two young girls and had another child on the way, according to his fiancé and a GoFundMe page started by a family friend. His fiancé told Denver7 she was “completely distraught” by Vasquez’s death. The GoFundMe page had already raised nearly $4,000 four hours after it was posted. Pamela Marques worked for more than two decades for the Packaging Corporation of America, a worker at the company told Denver7 Thursday. Marques’ niece, Anntionette Marques, said her aunt’s daughter and granddaughters were “her life.” “She’s generous, caring, … and her smile is contagious,” she told the Associated Press, adding that Marques was with her husband at the store when she was shot and killed. GoFundMe pages can be found for each of the victims at the following links: Marques ; Moreno ; Vasquez . Police arrested 47-year-old Scott Ostrem Thursday morning in connection to the shooting. He escaped the Walmart after allegedly shooting the three people, and was arrested just blocks away from his apartment. He has a history of run-ins with police in the Denver area, and was described as neighbors as “weird.” One neighbor said they had seen Ostrem carrying a rifle bag to and from his vehicle on several occasions. He worked for a Frederick roofing company and walked off the job Wednesday, according to the company. Denver7 is working to gather more information about the victims of the shooting. Stay posted to this story for updates.